On day 6 of my artist residency, I think I reached that point, not of no return, but of obstacle and tiredness. I’ve been working so early and so late each day that I think that the physical wear and tear from these intense days is catching up with me, because today’s adventure hit a few roadblocks. I began painting at 7am and worked on the next section of building up the texture with adding more paint daubs to the winter rain painting. Just as I was getting my groove, I almost forgot that I was scheduled to attend a seminar on online marketing for small businesses — a topic that is of interest to me and to communicating about my art and design business. The seminar was well attended and presented good information, but I couldn’t wait to return to the studio to keep painting! After that event let out at noon, I returned to the studio, and continued to paint. A good friend of mine, who is also an artist, visited me in the studio for a couple hours along with her 4 week old baby. 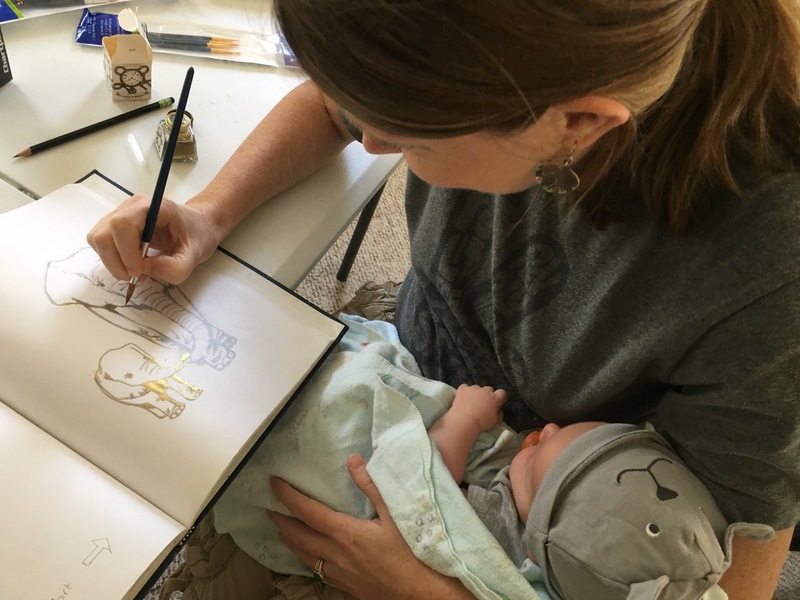 I could tell that she was an artist dedicated to her craft in how she cradled her baby in one hand as he slept, and continued drawing with the other hand. My friend and her little one left around 5pm, then I took a short dinner break and continued painting. I was just about to start smearing the pink-toned canvas with the pastel colors, but then in my clumsiness, my foot bumped the leg of the easel, and then this started a downward chain reaction — the painted wobbled, bumped the jar of paint thinner, which fell off the table and onto the floor, spilling all its contents. In my haste to try to catch the jar, I bumped the painting even more, causing it to fall off of the easel, and barrel towards the floor. I reached for it, smudging a big area of the blue-sky area of the painting, but the wet painted edge had already made contact with the wall and the carpet. (Just recalling the incident gets me all shaken up). I threw things out of the way and started to grab any rags or paper towels I could to be able to soak up as much of the spilled paint pigment & paint thinner as I could. I cannot express just how angry and frustrated I was that this all happened — and right as I was already feeling like I was a little bit behind on my projected work plan — now this was going to set me behind even more. With a clearer head and an action plan, I moved the canvas, secured it more tightly to the easel (this time with extra clamps) and proceeded to start the smearing from top to bottom with stand oil on the painting that had fallen. I cleaned up the smudges from my attempt to rescue the painting from its fallen demise. My husband returned later with the Bissell spot cleaner and dove straight into scrubbing the spot for me — upon his insistence that he help me in this way. Grateful for his help with cleaning up the rest of what seemed a disaster, I said I’d give him a shout-out for being such an amazing husband: I have an amazing husband and he came to my rescue in my moment of need! Put a cover on your jar of paint thinner when it’s not in immediate use. 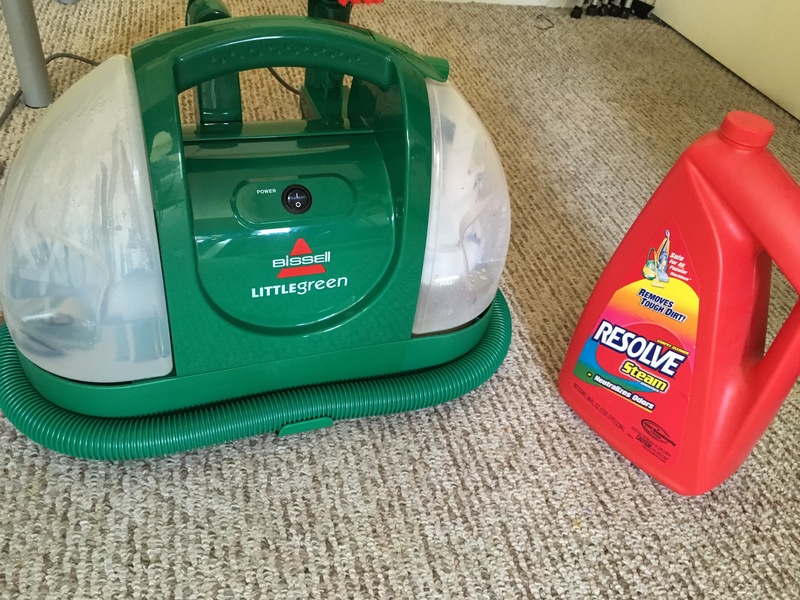 Keep a spot cleaner and carpet stain-cleaning solution in your studio if you have a carpet. Start a fund to install easier to clean hard-surfaced floors. 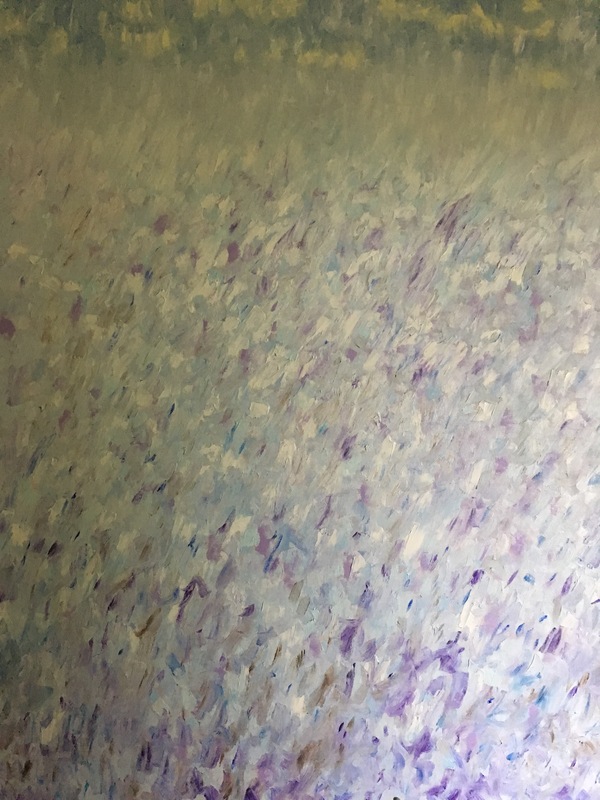 This entry was posted in artist residency 2016, Studio Views, works in progress and tagged abstract painting, oil paint, paint stains, painting in progress, spills. Bookmark the permalink.